Peacefully situated in the Western Tatras, Horsky Hotel Mnich is 8 km from the town of Liptovsky Mikulas and 15 km from the Jasna Ski Area. 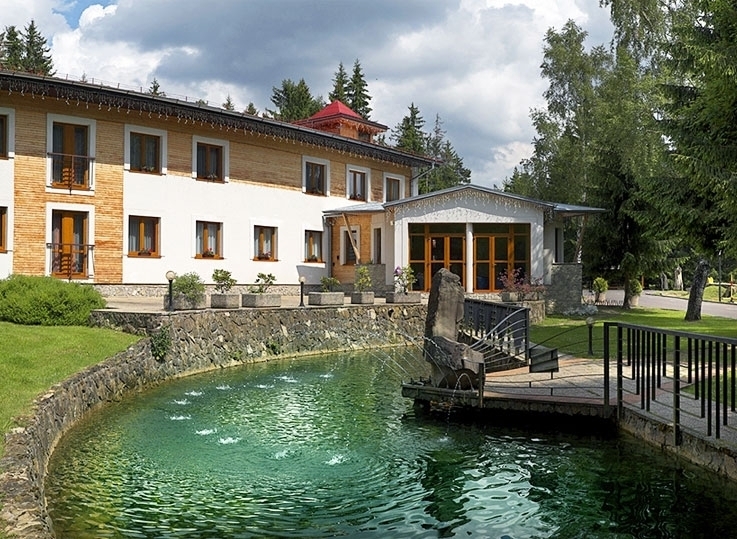 It has a sauna and a hot tub, as well as tennis, table tennis, a big children´s playground and billiard facilities. This mountain hotel features rooms and individual cottages. All units come with a free Wi-Fi connection, and comprise a private bathroom with a shower. Each room is also provided with a TV. The suites also features a small fridge. There is a restaurant on site, which offers a buffet breakfast in the morning and traditional Slovak dishes throughout the day. Barbecue facilities are available as well. Horsky Hotel Mnich is 8 km from the Aquapark Tatralandia. The Zoo Kontakt and the Liptovska Mara Water Dam are both within an 8 km reach. Private parking is possible on site for free. Set in the quiet village of Bobrovec, this complex offers wooden cottages in traditional Slovak style. Next to the mountain stream, a gazebo with barbecue is at guests’ disposal. Free Liptov Region Card with discounts on local attractions and discounts for ski passes are available.